Shopping for Alice in Wonderland Action Figures? A fully poseable 7-inch scale action figure based on Alice Through the Looking Glass! This 7-inch figure of the young Mad Hatter based on his appearance in sequel to Tim Burton's Alice In Wonderland, features the likenesses of Johnny Depp and has up to 16 points of articulation. 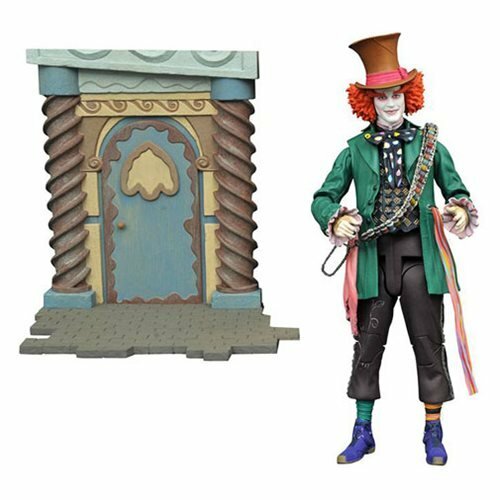 He comes with a diorama background depicting a building from Wonderland! The Hatter is individually packaged in the display-ready Select packaging, with spine artwork for shelf reference. Ages 8 and up.